← Final Desk Pictures this Weekend .. Promise! I finally finished the desk and breathed a sigh of relief that it turned out OK. It was certainly a project that challenged me and certainly elevated my woodworking skills. It was not, however, my favorite project. I followed plan which was actually overly complicated and had some confusing mistakes. That was a big part of problem (I’m talking to you Fine Woodworking). Marc over at the Wood Whisperer help me simplify things and got me off of dead center. AND … the project also took me waaay longer than I thought it would. I’ve been itching to move on. Anyway, its all done! Curly Cherry from Hardwood to Go. Curly cherry drawer fronts and doors. Doors! I still need another knob. Inside the cabinet behind the folding door. Fold down front for pull out key board. The pull out key board is drying in the garage and I still need one more knob for the doors. But, at least for this weekend, there’s no more time to work on it. Finish is Daly’s Profin over one coat of shellac. All posts associated with this project are here under the Desk Project Tab. This entry was posted in desk, door and tagged desk, woodworking. Bookmark the permalink. 18 Responses to Desk .. Done .. Thank Goodness! Wow, that looks amazing Marilyn! Thanks! I’m super relieved that the combination of woods didn’t end up lookin’ silly. The figure in the doors and drawer fronts is fantastic! Stock selection is so important to make a good project into a great one and you nailed it. I feel your pain though, a grandfather clock I built from plans in 94 has an eight day movement needs winding approximately every 7 3/4 days due to wrong dimensions in the plans. Wow. Glenn Huey in a skirt!! This is gorgeous. You’ve done a wonderful job. You did an excellent job! It looks great! I built this desk right when that issue of FWW came out. What was so confusing about it? I thought it was a breeze. 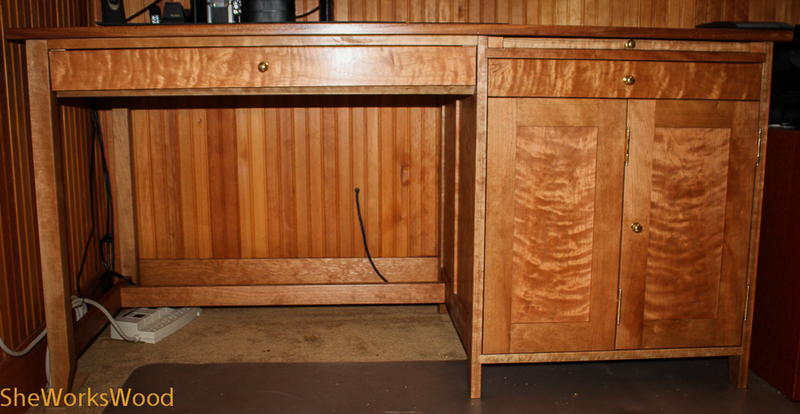 All solid wood (cherry) including the drawer bottoms. The drawers are hard maple. It’s awesome and shows no sign of *ever* falling apart. Lovely desk, Marilyn, you did a fantastic job. I’m not a huge fan of curly cherry wood myself but I’d certainly use a different wood as this is a nice design. Thank you! A lot of the work I do is with Cherry. This time, I used shellac under ProFin and the cherry continues to look beautiful.